Popular and used a lot in the cosmetics and skin care world, shea butter and cocoa butter stand out with their amazing nutritional qualities and advantages for the skin, hair and nails. What if you have to choose between the two? Which one is going to be the better option for your case? Let’s take a closer look at each of them and see what are the ups and downs for each of them so that you may easily decide at the end of it all. What is shea butter? How is it made? What are the states of Shea butter? What is cocoa butter? How is it made? Where are shea butter and cocoa butter coming from? Do they smell or look similar? What are the similarities between the two? What are the specific characteristics of Shea butter? What makes cocoa butter so special? What does shea butter do for the hair? What to remember when using shea butter for your hair? What are the benefits cocoa butter for hair? Shea butter is a natural nut butter and it’s made from the hard seeds of the African Karite tree, which is found in both Central and Western Africa. When it comes to the extraction process, the harvest and the collecting of the shea nuts are the main things to be done. Once the nuts are collected and all the impurities are removed from the surface, they’re going to be boiled so that the outer cover is softened. After the shells are softened, the nuts are going to be put aside for cooling and opening for revealing the fatty interior. The fatty part is going to be scooped out and boiled so that the butter is separated by any impurities (bits of shell or various fibrous material). When this phase is over, the soft shea butter is going to be filtered and packed. This is the 100% pure raw shea butter. 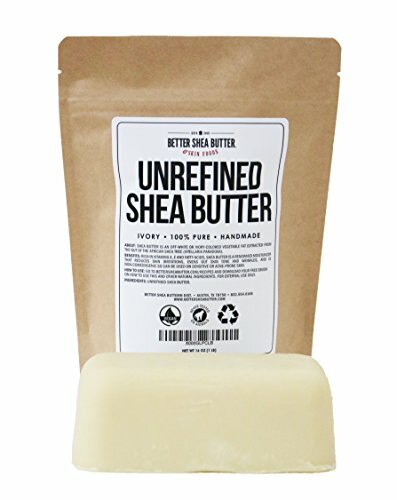 A popular choice out there is the Unrefined Ivory Shea Butter – Raw, 100% Pure, from West Africa. Able to relieve eczema, improve the collagen production, moisturize your skin, reduce inflammation and make the stretches and scars less visible, the raw shea butter is imported from Ghana and has a nutty and smoky scent. Its color may vary from off-white to cream which is only going to confirm that it’s raw. Shea butter is in fact an edible oil and people also use it as cooking oil, moisturizer, candle-making, waterproofing wax and even hair-dressing. Shea butter has a beige natural color, but it may also be refined. Typically, it has a nutty-smoky scent which can make some have a second thought about it. However, the smell doesn’t linger for long. Solid at room temperature, the Shea butter is going to melt when you warm it. It may last around 2 years until it goes rancid. If you want to go with ultra-refined shea butter, take a look at the 100% Natural African Shea Butter – Ultra Refined. The shea butter is grade A and it’s loaded with nutrients, but doesn’t present the specific odor of raw and unrefined shea butter. You can easily use it as a moisturizer, all-natural hair conditioner and even makeup remover. It’s a great addition to soaps, lip balms and various cosmetic items. 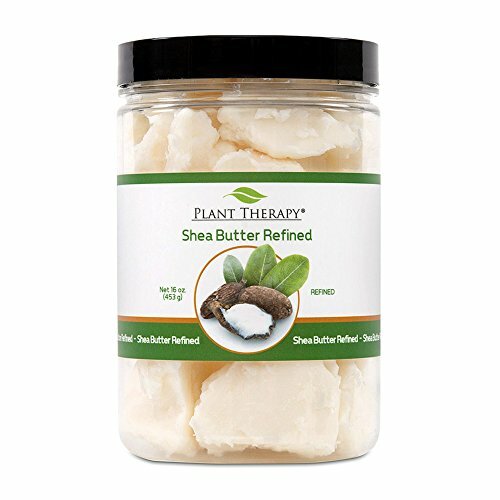 If you want to use refined shea butter, take a shot with the Plant Therapy Shea Butter Refined. It has a lighter scent and feels creamier due to the refining process. this only makes it an ideal option for use in creams, balms, soaps and lotions, leaving a satiny finish every single time. Cocoa butter is a natural-based butter that is extracted from the cocoa beans (the same beans used for chocolate). It’s one of the most stable fats that we know as it’s loaded with antioxidants. 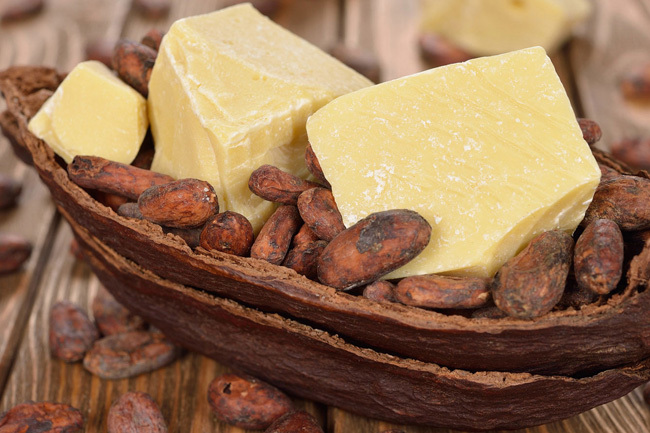 Unlike the shea butter, cocoa butter doesn’t get rancid for 2-5 years. It remains solid at room temperature, but it melts at body temperature. The processing of cocoa beans is in fact more complicated than the shea nut. The whole process is known as the “broma process”. simply put, the harvested, washed and air dries cocoa bean is going to be roasted at an even temperature until it’s going to crack open. The cocoa nibs are going to be removed and grinded for making cocoa liquor (a rich liquid). It’s the cocoa liquor that the cocoa butter is going to be extracted from, through an extrusion device/screw press. 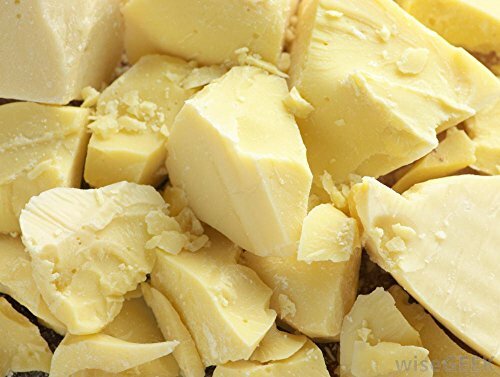 Unrefined cocoa butter- has the famous smell of chocolate and has a yellowish color. It has all the valuable nutrients. The Cocoa/Cacao Butter Ultra Refined Organic Natural is going to maintain wrinkles at bay, while moisturizing your skin. it also prevents various skin affections (acne, eczema) and reduces inflammation. 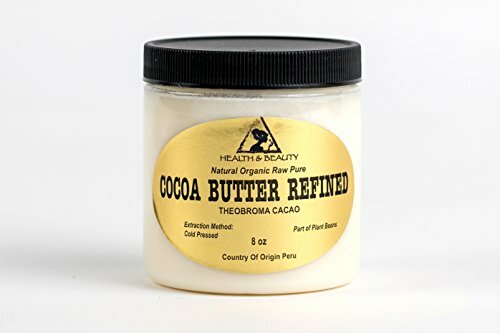 It’s a reliable refined cocoa butter that works great for moisturizing your skin. If you’re determined to try raw cocoa butter, you should give it a try with the Raw PRIME & PURE Cocoa Butter. The cocoa butter comes in chucks and smells amazing. It melts at room temperatures and you may use it for all sorts of formulas. Even if this isn’t a main difference, it’s sure one to begin with: cocoa butter is extracted from cocoa beans, whereas shea butter is made from the nuts of the Shea tree. Also known as the cacao tree, the cocoa tree is native mostly in the tropical areas from South and Central America. On the other hand, Shea tree only grows in Africa. Even if both Shea and cocoa butter are natural plant-bases fats, loaded with vitamins and nutrients, they actually come from different regions of the world. In order to be accurate, we’d like to highlight that we’re only comparing the unrefined states of cocoa and shea butter, with no hexane, bleaches or other synthetic solvents that are added for changing the structure/appearance/smell of the butters. The unrefined butters are going to maintain the basic characteristics of the fruits used for the extractions. The natural shea butter has an ivory/creamy color and its scent is rather smoky and a bit nutty. The cocoa butter is a bit darker than shea butter (it has a brown ting to it), whereas its smell is the astonishing and one-of-a-kind scent of strong chocolate. When it comes to consistency, we find the shea butter to be softer and you may easily use your fingers for breaking off a pea size. You can actually use a fork or whip it with your electric mixer for making body butters. Shea butter does melt on skin contact. Cocoa butter sits on the other side: it’s hard as a rock. You’re going to need a knife for breaking it and your fingers are going to be useless. As cocoa butter also melts on skin contact, you may need to melt it before adding it to your DIY whipped body butter formulas. It’s only natural for one to wonder which of the two is going to work for their skin, hair or nails. Truth be told, shea butter is definitely going to win the popularity test and people seem to love using it for quite some years now. However, keep in mind that they have almost identical beneficial fatty acids and antioxidants, even if the concentrations are different. An acne-prone skin isn’t going to need cocoa butter, as it’s only going to make it oilier and even clog the pores. This is why shea butter is a reliable hair conditioner, whereas cocoa butter may be too greasy for some types of hair. Cocoa butter wins its fans with the amazing fragrance, many using it as a base for essential oils or a massage oil. At the end of the day, both cocoa and Shea butter come with ups and downs for the skin, so it’s entirely up to you to decide which takes the lead in your case. it’s high in vitamin A, E and F. Vitamin A and E work as powerful antioxidants that heal the skin, whereas vitamin F is a good source of fatty acids, softening and helping the skin appear young again. It has a high healing fraction (this relates to the concentration of vitamins, minerals, nutrients and phytonutrients that sustain the healing). Unlike many other seed oils that have a 1% healing fraction, shea butter actually has an impressive 5-17% healing fraction. It’s great to use during winter and after sun care. It’s safe to use in eczema, sensitive skin, psoriasis, rashes or cracked skin. Stearic acid is the one that makes Shea butter hard, whereas oleic acid is both rich and heavy fatty acid that moisturizes and nourishes the skin. It’s high in vitamin E and K. As many of you know, vitamin E is a powerful antioxidant that is going to make the fine lines and wrinkles less noticeable. Vitamin K is capable to reduce the under eye circles and bruising. It contains cocoa mass polyphenols (CMP) which are able to block the growth of cancerous cells. The polyphenol is also useful in dermatitis and rashes, as it inhibits the production of immunoglobulin (which actually worsens the aforementioned conditions). It’s high on the comedogenic scale, so it’s going to clog pores (it’s not an option for the acne-prone skin). It contains plant sterols that have wound healing and skin repairing abilities. Stearic acid makes the cocoa butter hard and the oleic acid has the moisturizing and nourishing abilities. It’s loaded with vitamins A and E, which explain its emollient and healing abilities for the skin. the high content of fatty acids adds nice moisture to your hair, reducing the dryness and preventing the split ends. The fatty acids reduce frizz, but improve shine. It protects your hair from heat damage caused by heat styling tools. It has anti-inflammatory abilities, reducing redness and scalp irritation as it has healing properties and doesn’t clog the pores. It’s safe to use on all types of hair, dry, damaged and color treated hair included. You can use raw shea butter, but also other hair care products that are going to eliminate frizz and lubricate the cuticles. 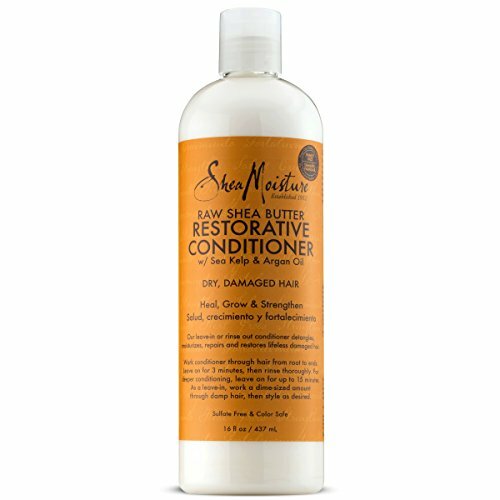 Made with certified organic shea butter, but also with argan oil and sea kelp, the SheaMoisture Raw Shea Butter Restorative Conditioner is going to soften your hair, leaving it shiny and full of luster. 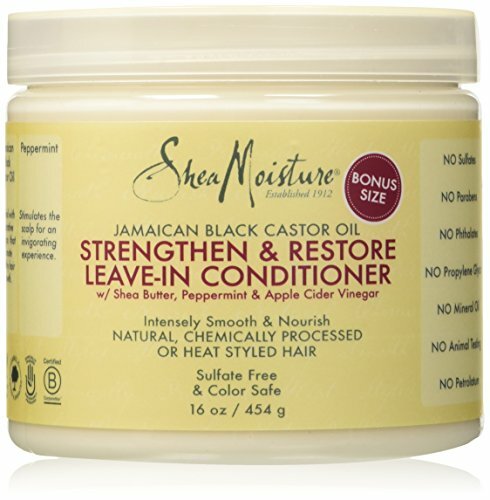 It locks in moisture and nourishes the scalp, protecting it throughout the entire day. An effective leave-in conditioner that is going to leave your hair soft, shiny and frizz-free is the Shea Moisture Strengthen & Restore Leave-In Conditioner. made with certified organic raw shea butter, black castor oil, peppermint and many more, the leave-in conditioner is going to repair and nourish the dry and damaged hair. It hydrates the hair, leaving it smoother and healthier looking. 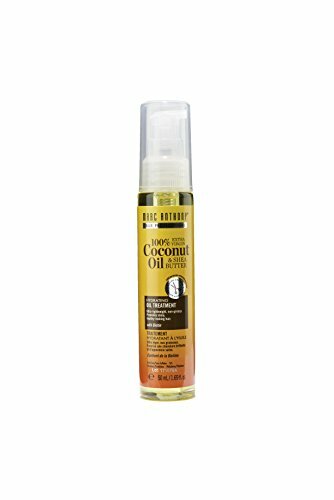 The Marc Anthony Coconut Oil & Shea Butter Treatment is infused with biotin and has a non-greasy and very light formula. It reduces frizz, hydrating and strengthening the hair, helping it look shiny and healthy. The formula is sulfate-free, paraben-free and phthalate-free. Oils and butters may leave an unpleasant film on your hair, which is annoying especially when you have thin hair as it weighs it down. One of the best things you can do for protecting your hair is to use some cocoa butter before shampooing. It’s able to moisturize and coat the strands, protecting them from the drying side-effects of shampoo. Apply some cocoa butter 2-24 hours before washing day so that you may reduce the risk for tangling and breakage. A healthy scalp is always going to make the hair look better. you should use the cocoa butter as it goes deeply into the scalp, healing the skin. it has a rejuvenating effect of the scalp, helping the follicles to grow hair. Due to its antibacterial and antifungal properties, cocoa butter should be used for healing scalp oil, reducing inflammation and slowing down the aging of the scalp. Cocoa butter increases the volume as it strengthens the strand and reduces the risk for protein loss. You should use it when dealing with hair fall or hair breakage. You can use it as a pre-poo, conditioner or other formulas for the LOC method. 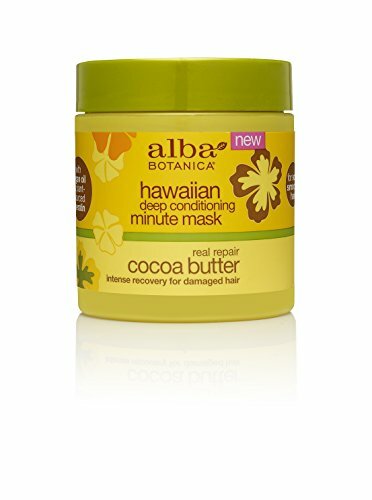 Take a look at the Alba Botanica Real Repair Cocoa Butter Hawaiian Deep Conditioning Minute Mask. the mask is made with cocoa butter, argan oil and plant-sourced keratin so it’s able to strengthen and nourish the hair strands. You should always grab a cocoa butter product by the pool as it’s capable to protect your hair from chlorine and sun rays. It softens and protects the strands, so don’t hesitate to use it. It’s quite common for cocoa butter to be compared with shea butter as they’re similar in so many ways. Both cocoa and shea butter are popular for their moisturizing properties, having the ability to improve the elasticity and moisture retention of hair. An elastic hair is going to stretch and not break when pulled. Both butters are going to nourish the scalp, helping in eczema and psoriasis. They coat the hair strands and reduce the protein loss from the shaft. They make good shampoos, pre-poos and conditioners as they prevent the risk for tangling and breaking of the hair. The butters are able to absorb deep into the skin, which is going to rejuvenate the scalp. Exfoliation and moisturizing of the scalp are going to make it easier for the follicles to grow hair. Both cocoa and shea butter have a hard texture and you may need a knife to cut both shea and cocoa butter especially. Cocoa butter’s melting point is 93-101 F degrees, whereas shea butter’s is 89-100F degrees. You should always get unrefined butters all the time. Even though the refined ones still moisture, they lose almost all of their healing abilities. Shea butter is high in vitamin A, E and F, while cocoa butter is only high in vitamins E and K. shea butter protects and rejuvenates the skin, slowing down the aging of the skin and going deep into the skin and moisturizing it. Cocoa butter is an efficient moisturizer as well, helping the dark under eye circles and bruises look subtler. Cocoa butter is really high on the comedogenic scale, so it’s going to clog the pores. If your skin is prone to acne, you should stay away from it. On the other hand, shea butter has a comedogenic rating of zero so it’s not comedogenic at all. Cocoa butter includes plant sterols which may prevent cancer, but also polyphenols that are anti-cancerous, blocking the production of immunoglobins. Shea butter is loaded with allantoin, slowing down the aging of the skin. Shea butter impresses with its 5-17% healing fraction, whereas seed oils are unable to match since they have lower healing fractions. As it’s high on vitamin A, shea butter has an SPF rate around 5, whereas cocoa butter doesn’t provide sun protection. You should use shea butter before and after sun care. Cocoa and shea butter are amazing emollients that benefit the skin and hair. If your skin is acne-prone, you shouldn’t use cocoa butter. If you go for the chocolate smell, go with cocoa butter but don’t rule out shea butter as it brings so many good things to the table too.